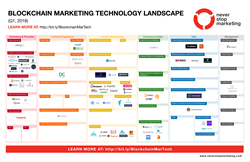 The latest Blockchain MarTech and AdTech Landscape from premier marketing advisory firm for blockchain startups, Never Stop Marketing, shows a new crypto-enabled market for marketing technology is emerging at a torrid pace. This is a tremendous growth rate. It took over three years for digital marketing technology solutions as a whole to grow 400%. Never Stop Marketing, a leading provider of blockchain marketing services, released the Blockchain Marketing Technology Landscape (BMTL) for Q2, 2018, which illustrates a nearly 400% growth in blockchain martech and adtech startups in the past six months. While not represented in the landscape per se, Never Stop Marketing’s research also uncovered some nice stories of traction on the part of some of the more established players in the market. The OnXchng partner program now has 10 partners, with an estimated 300mm in mobile ad unit inventory. Marketers and advertisers need technology to get their jobs done. As the crypto market grows, the rate of innovation in the blockchain martech and adtech space will continue to grow as well as we discover new ways for marketers to deliver value and improve ROI via crypto-based models. Projects seeking to be profiled are requested to complete this form for consideration. Jeremy Epstein is CEO of Never Stop Marketing and the former VP of Marketing at Sprinklr, guiding the company’s promotion from Series A through "unicorn" status. Jeremy currently works with some of the world’s leading crypto startups including Zcash, OpenBazaar, ARK, and Peer Mountain. He advises F2000 organizations on the implications of blockchain technology and is author of the ebook "The CMO Primer for the Blockchain World." 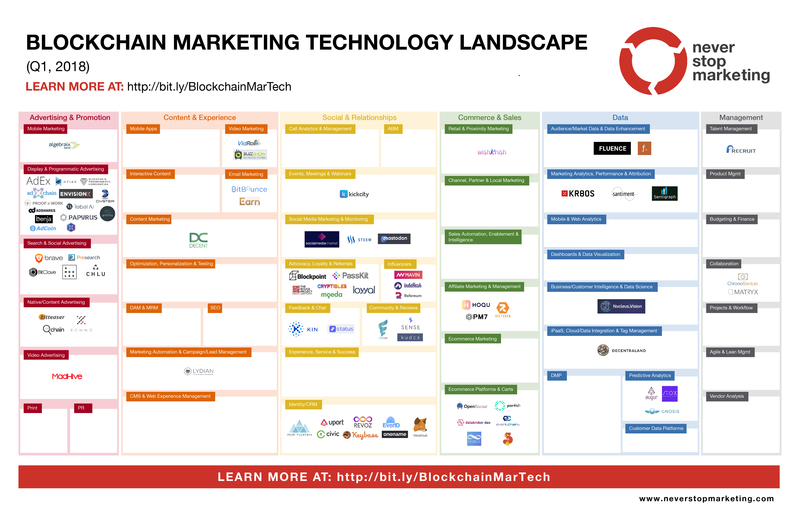 Blockchain Marketing Landscape (Q1, 2018)The Blockchain Marketing Technology Landscape tracks the evolution of marketing and advertising solutions based upon blockchain and decentralized technologies.